Throughout the history of my blog, I have posted about my travel adventures and weekend getaways. Though every day is different, here I write about just a “normal” day in my life as a Peace Corps Volunteer. Nothing out of the ordinary, just life. 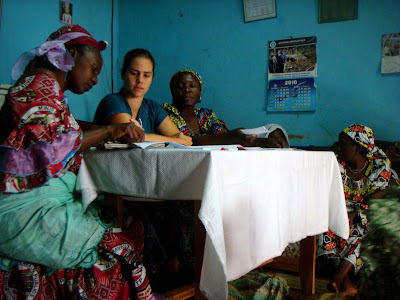 10AM – VSLA meeting (see post below) with a group of mostly Fulfulde-speaking women. 1PM – My buddy, Dali, and I head off to the Ministry of Justice to pick up a basket of food to take to her uncle’s house. 1:15PM – We watch the prayer at the Grande Mosque. Hundreds of Muslim men are praying. 1:30PM – We take a taxi to the neighborhood of Mauwi where Dali’s uncle lives. I take a nap on the couch as the rain pours. 3PM – We taxi to the Petite Marche (literal translation is Small Market, though the Petite Marche is bigger than the Grande Marche ‘Big Market’). Thought it’s pouring rain, Dali insists that we get out and rest under an awning of another mosque to wait for the rain to stop. 3:30PM – I try to tell Dali that I recently found a guy that sells Cameroonian soccer jerseys, but it gets lost in translation. Thus, she takes me to her guy. He comes back with two XXXL jerseys and though he says it fits me well, I ask for the kids’ size. Dali helps me haggle for 1.500CFA ($3US). We proceed to spend the next forty-five minutes haggling for a Cameroonian track jacket. The merchant starts at 6,000CFA ($12US) for the matching pants as well. I just want the jacket and we get him down to 3,000CFA ($6US). However, Dali says no as the jacket should only be 2,000CFA ($4US). His last offer is 4,000CFA ($8US) for the entire ensemble. So, I walk away. After exploring the market some more and finding nothing, I finally translate the deal into US dollars and realize that I was actually being offered a good Cameroonian price too. So we go back and buy the ensemble. 4:30PM – I walk Dali home as I have a broken, yet decent umbrella. After arriving at her house; however, Cameroonian hospitality kicks in. She changes her shoes, puts on a jacket, and then proceeds to walk me back to my house! 5:30PM – PCV Andrea DeRocco comes straight to my house off a six hour bus ride from the village of Belel. She’s my first guest to stay on my festive, blue couch! 6:30PM – PCVs Brian Hillary and Jessie Warning (my postmates who live in the same city as me) and Andrew Ryan (who lives in Meiganga about four hours away) come over for dinner. We all cook together and then eat in my living room like one big happy family! Happy and full after a good dinner! The Village Savings and Loan (VS&L) Model is a methodology created by Hugh Allan and Mark Steghle of VSL Associates. When individuals are too poor to meet even a microfinance institution’s minimum or when individuals may be too scared of financial institutions in general, step in VSLA! This model can reach those that MFI institutions cannot reach and can further complement those that are already clients with MFIs. Members choose a share amount and at each meeting, members buy between 1-5 shares. The shares in turn serve as capital for the group when a member would like to take a loan. That member will then reimburse the loan with a service fee that the group chooses.. The group can also choose to implement fines when somebody is late, absent, etc. At the end of each cycle, each member receives the shares that they have saved along the profit from the fees. For example, one women’s group I work with has a share amount of 500CFA (equivalent to $1US). During one meeting, a women could decide to buy 1000CFA ($2US) worth of shares and the next week, she could choose to only save 500CFA. The money stays inside a wooden cash box along with each members’ notebook of transactions. At another meeting, the same woman can take out a 25,000CFA ($50US) loan to help augment her tailoring business. She would then pay that loan back with the service fee each month (in this group’s case, 10%). At the end of the year, each part will grow depending on the fees collected. Each part for this group could very well be 700CFA, thus for every 500CFA share the woman saved, she will receive 700CFA. One of the best parts of the VSLA model is that in essence, it requires no outside funding and the groups have the potential to become self-sufficient and sustainable. I have inherited 11 groups from my PCV predecessor and will create more VSLA groups in the future! After hearing adventures of daily moto rides and frequent marriage proposals, folks from home always pose this question as the development work of a Peace Corps Volunteer can vary dramatically. In Cameroon, there are four projects: Education, Community Health, Agroforestry, and Small Enterprise Development (a fifth Girl's Empowerment-ish program is currently planned for late 2011). Victory over Poverty (VP) can be achieved provided that the Means (M) and Competences (C) of the Community (C) are pooled together. This is my primary project in which I serve as a technical advisor. I will spend the first two to three months observing and learning the operations of the organization and will then proceed with implementing recommendations. *As of July 2012, MC2 has organized a targeted promotion increasing its women's savings accounts by 16%, strengthened its community outreach, trained all of its employees in information technology, and evaluated its due diligence procedures to decrease loan disbursement meeting times by 15%. What Do Americans Do When it Rains? After 3 and a half months of wet season, I’ve grown accustomed to what Cameroonians do when it rains: stop…just stop. Popular transport is by moto and when it’s rainy, it’s much too dangerous to ride a motorcycle. Though umbrellas exist, pouring rain is much too strong for cheap umbrellas to handle. Thus, if there is a meeting, it won’t start until after the rain has cleared…perhaps ten minutes later…maybe twenty minutes later…and every now and again? If rain lasts for an hour or so, perhaps people won’t show up at all. Or also, if you are at a Cameroonian’s house in this PCV’s case, you hang out chatting in French for a good two hours until the rain stops. Usually the rain comes in spurts and afterwards one can continue on his or her day after a few minutes. But really, what do Americans do when it rains? I know that life goes on in spite of the rain, but I forget. Welcome to Eid ul-Fitr! This holiday marks the end of Ramadan, the Muslim holiday which requires individuals to fast for a month from dawn to dusk. Fasting symbolizes the cleansing of the soul while multiple prayers occur throughout the day. The month is believed to be when the first verses of the Qur'an were revealed to the Muhammad, the Islamic prophet. And in Cameroonian culture (as well as many other cultures), it’s customary to eat…A LOT. In fact, if you don’t eat a lot, it means that you have not enjoyed the food and thus, you have insulted the cooking of the host. Hence, you must eat! 10:30AM-Always be prepared with a book here in Cameroon! Though I’m ready at 9AM, Dali shows up an hour and a half later and says the celebrations won’t be until the afternoon. However, the Lamido is supposedly coming down the main road, so I wait at her salon until everybody starts running to the street to see the local chief and his horses. My neighbor’s kid, Abdul, runs after the Lamido for a good ten minutes! 11:00AM -I attempt to leave the salon, but Dali reminds me that I agreed to go to her Uncle’s house. I remind her that’s no problem as Iong as I’m back at 1:30PM to eat with my host father’s friend (we’ve never met, but I was commanded by my host father to eat with him for the holiday). Naptime. 12PM-We go to Dali’s house as she needs to get ready and her little sister sings my name. Why I love the singing, I don’t really know. 12:30PM-Dali and I take a moto to bring a basket of food to someone. I don’t really understand what’s going on, but such is life. 1:05PM-We arrive at Dali’s uncle’s house who lives out by the Legion d’Adamaou. Dali’s two little sisters are there too and we enjoy chicken, hibiscus juice, and cake with her aunt. So good! 1:25PM-I jump on a moto back to my apartment while my host father’s friend calls saying that he is sending a moto to search for me. 1:35PM-The moto and I head back down the same road I just took. This time, instead of eating with all women and children, I’m eating with all men! It’s almost symbolic because as a foreigner and guest, I get placed with the men. 2:45PM-Moto boy takes me back and Dali, Kim (another PCV), and I all head off to the Lamido Palace. Well, first we end up at Dali’s aunt’s house and run into the two little sisters and Abdul again– you never really know where you end up here in Cameroon. We head off to the Lamido Palace, but they are just praying at the moment, so we visit Dali’s mom. Dali's extended family - cute, no? 4PM-In the random crowd at the Lamido Palace, we run into my sidekick Abdul again! Because we are foreigners, we get taken to the VIP seats on the steps of the Palace and sit with the Delegate for the Ministry of Tourism. 4-6PM-People pray to the Lamido and people play with the bulls. Long day, but home sweet home with a stuffed tummy! Expats. We live halfway around the world, but the lengths we go through to vote at home! Sometimes though, being a world away does make one appreciate the right to vote. I had filled out one of those absentee ballot request things online. Well, I may have filled it out twice as there’s one for absentee voting and a different one for absentee voting overseas. Once an Orange County resident fills out the absentee voting overseas request, he or she can download paperwork to 1) mail, 2) fax, or 3) scan, e-mail, and then mail back to the States. As mail can take three weeks, I would not have enough time for option number one. Thus, I went on a hunt for an international fax. Luckily, next to the Peace Corps office in Ngaoundere, MTN offers international calling (for only 10cents a minute!) and international faxing. Too bad the fax was broken. After random instructions of some other places that may fax, I decided to scan. Too bad they don’t have .pdf like the election papers require. I’m e-mailing it anyways. Crossing the fingers that I can vote!